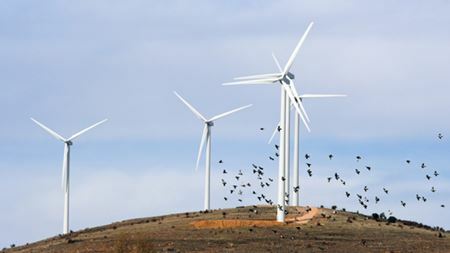 The US wind industry installed 539 MW in the first quarter of 2010, the lowest first quarter figure since 2007. Indian Energy Ltd has closed project finance with State Bank of India for its 16.5 MW wind farm at Theni in Tamil Nadu, India. Vestas has entered agreements with EDP Renováveis and four Chinese power producers for the delivery of up to 2298 MW of wind turbines. The US Department of the Interior (DoI) has approved the first US offshore wind farm – the Cape Wind project – off the coast of Massachusetts. Vestas saw a €82 million loss after tax in the first quarter (Q1) of 2010 compared to a profit of €56m in Q1 2009. Small wind power in China could reach 3-10 GW of installed capacity in 2010 if a set of measures laid out by a small wind roadmap for China. The Tûranor PlanetSolar composite catamaran will aim to sail around the world powered only by solar energy. REpower Systems AG will deliver 44 wind turbines to Al Yel ELektrik, a subsidiary of Akuo Energy SAS, for a Turkish wind project. Wind turbine blade manufacturer LM Glasfiber has changed its name to LM Wind Power. Siemens Energy is launching its SWT-3.0-101 3 MW direct drive wind turbine. WinWinD’s delivery of a 24 MW wind farm to Aseri, Estonia, has been confirmed. Global standards for wave and tidal power devices are being developed by the European Marine Energy Centre (EMEC). Windstream Wolfe Island Shoals Inc will develop Canada’s first offshore wind farm. Platina Partners LLP is buying 52 MW of the 140 MW Fruges wind farms in Pas de Calais, France, worth €71.3 million. GDF SUEZ has completed the construction of its first UK wind farm project at Craigengelt, near Stirling, in Scotland. The first major solar facility in India will be used to power a stadium to be used in this year’s Commonwealth Games. DONG Energy has submitted a binding tender to build a 400 MW offshore wind farm outside Denmark. A solar powered airplane has taken its first major test flight from an airfield in western Switzerland. Siemens will deliver 208 MW worth of wind turbines to two wind projects – one in Germany and one in Canada. REpower will deliver 15 wind turbines to Poland and 18 wind turbines to Italy, totalling 67.65 MW. The US wind energy industry employs 85,000 people, according to the annual industry market report released by the American Wind Energy Association (AWEA). WindWinD says its new wind turbine facility, based in Hamina, Finland will produce 3 MW wind turbines and increase its total capacity potential tenfold. Vestas has announced three wind turbine supply deals to the USA, Australia and Turkey over recent weeks totalling up to 460 MW. The UK Government has pledged £4 million to a partnership to fund a new radar system for the Greater Wash to address wind turbine interference.